Dragonfly Environmental were awarded an Engineers Australia Award for Excellence in 2011 for carrying out the world’s largest ever saltmarsh re-creation, undertaken in Penrhyn Estuary, Botany Bay, as part of works to mitigate the impact of nearby port infrastructure expansion. 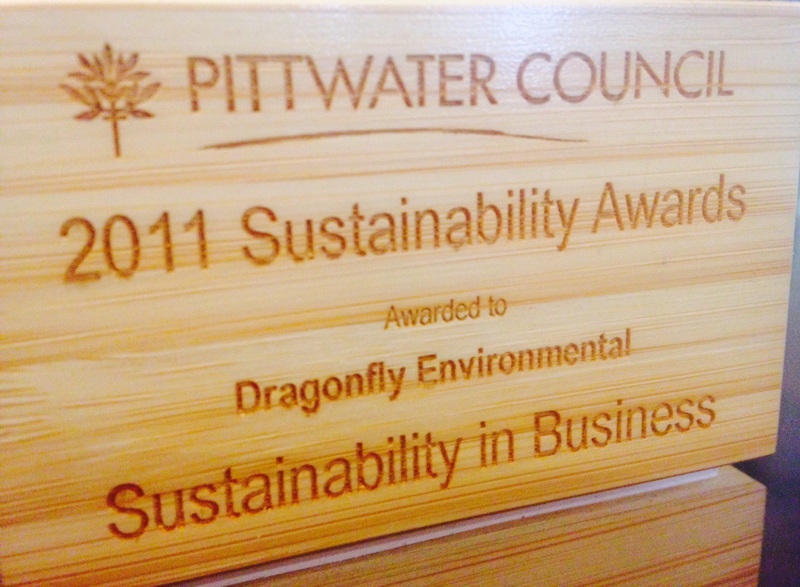 Dragonfly Environmental won a Pittwater Sustainability Award for reducing its business operations’ carbon footprint. such as brush cutters and chainsaws and emissions from electricity and waste streams and green waste from outdoor works. The actions that are being taken to reduce these Green-house emissions are detailed in the Company Carbon Action Plans. In addition, Dragonfly Environmental works require an abundance of materials. As a result, Dragonfly Environmental actively purchases materials that have come from waste streams (mulch, soil, wood and stone). In design works it is specified that materials used are recycled / reused materials so that our Clients can also minimise purchasing from raw materials. Furthermore, Dragonfly Environmental has replaced the use of herbicide where ever possible with use of other techniques such as thermal weeding which is especially effective in water-ways. Dragonfly Environmental also has minimal paper use with a high level of automation of forms and electronic-applications via mobile phones and electronic forms. Lastly, Dragonfly Environmental’s nursery uses water tanks to provide much of the water used and for water-plants large pots are filled with water then left for weeks. 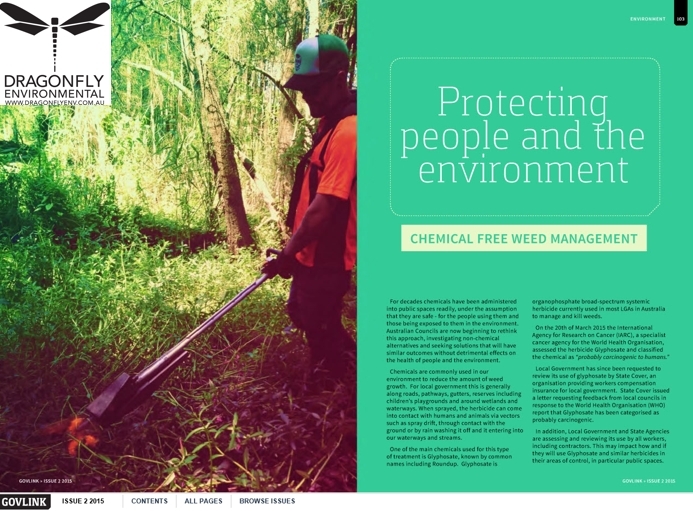 Chemical Free Weed Management. Read this informative article here. Update on Saltmarsh Restoration at Port Botany. Get up to date here. 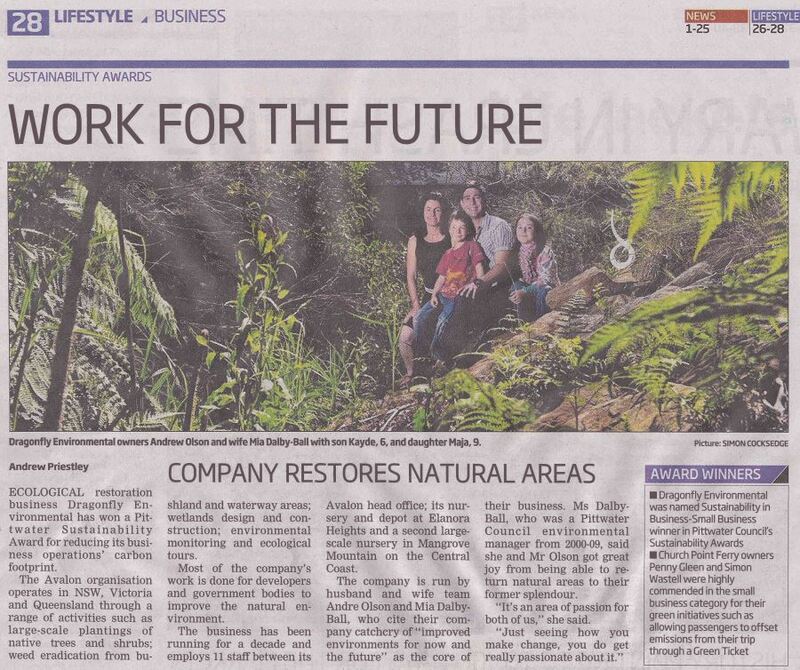 Responsible for controlling approximately 80% of aquatic weeds in Warriewood Wetlands, an article was released in Pittwater Online News paying homage to Dragonfly Environmental’s successful work. Mia Dalby-Ball formerly from Dragonfly Environmental spoke at the 2010 Community Forum on spiritual connections to the land.